"Where the Pavement Ends the Adventure Begins"
I had been using a K&N drop in air filter in my '93 Explorer for several years, but was thoroughly unimpressed by it's claim to increased performance. When I heard about KKM's True-Rev Sport Induction Kit I knew I had to give it a try. KKM has been serving Ford enthusiasts for over two years. Warren Kurtz is a Ford enthusiast himself driving both a Ford Ranger and a Contour SVT. Warren opened Kurtz Kustom Motorsports because of the lack of availability of parts for his favorite Ford vehicles. The True-Rev Sport Induction Kit has been designed to completely eliminate the restriction to airflow caused by the stock Ford airbox. The stock intake system on a '91-'94 Explorer pulls air in from behind the grill nearly even with the passenger side headlight. The air then has to flow through a highly restrictive plastic tube finally exiting in the base of the stock air box. Besides being a restriction to air flow, the stock setup is also very prone to taking on water when crossing streams or even when traveling down flooded roads. By eliminating the stock airbox and replacing it with a True-Rev Sport Induction Kit airflow to the engine is greatly enhanced. A side benefit is that the air filters new location makes it much less susceptible for water to be drawn in. The kit is well thought out, assembled with high quality components and installs easily in about an hour. After installing the kit I noticed a definite improvement in seat of the pants acceleration. The engine has improved mid and high end performance revving quicker and more freely. I fully recommend this kit to any Ford Explorer enthusiast looking for maximum performance from their intake system. 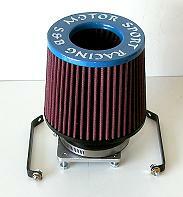 I also recommend this system to offroad enthusiasts who want to reduce the chance of taking water into their engine. The True-Rev Kit is available for all Explorers from '91-'99 with either the V-6 or the V-8. Visit KKM's website at: www.Kustomz.com for prices and more information. 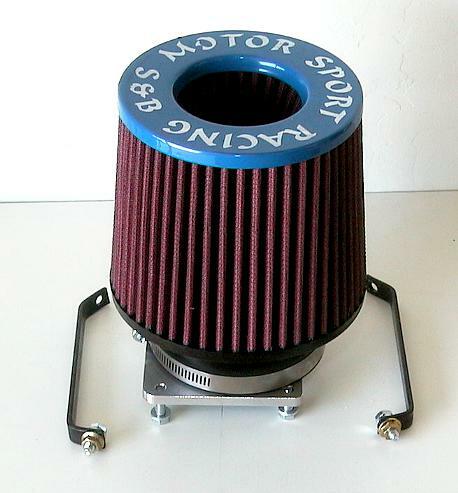 attaches the filter to the air box base. Installation will vary from vehicle to vehicle due to differences in tolerances. These instructions detail my experience with a '93 Explorer. Step 1. Remove the negative battery cable. This will prevent any shorts from occurring and will also reset your computer so it can "re-learn" the engines new air fuel requirements. Step 2. Remove the factory airbox assembly. Loosen the clamp holding the intake pipe to the throttle body. Unplug the connector from the MAF and remove the rubber hose running between the oil fill neck and the intake pipe. Disconnect the two vacuum lines from the top of the air box. Remove the two screws holding the air box lid in place. Now you can remove the whole top half of the assembly by pulling and twisting the intake pipe connection at the throttle body. Step 4. Bolt the True-Rev adapter plate and the support brackets to the MAF. The brackets are attached to the lower half of the MAF. Leave the bolts holding the brackets slightly loose for now. Make sure the longer bolts pass through the support brackets. Step 5. Reinstall the intake pipe assembly to the throttle body leaving the clamp loose. Line up the brackets on the MAF with the existing airbox base plate in such a way that the air filter is unobstructed and so that the intake pipe is not interfering with any engine parts such as the alternator pulley. When you find a suitable location mark and drill holes through the base plate. In my specific installation I needed to supply a 1-1/2" x 1/4-20 bolt. This bolt passed through the base plate and the inner fender well. Step 6. Recheck for clearance around the entire installation. If everything looks good, tighten the MAF bracket bolts, the intake pipe clamp and reinstall the MAF connector. Step 7. 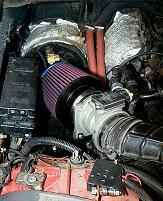 Install the supplied aluminum plug in the vacuum line that was attached to the stock airbox. This is the line that runs to the manifold. The other line can be left open or removed depending if you decided to keep your stock heat riser in place or not. Step 7. Reinstall your battery cable. 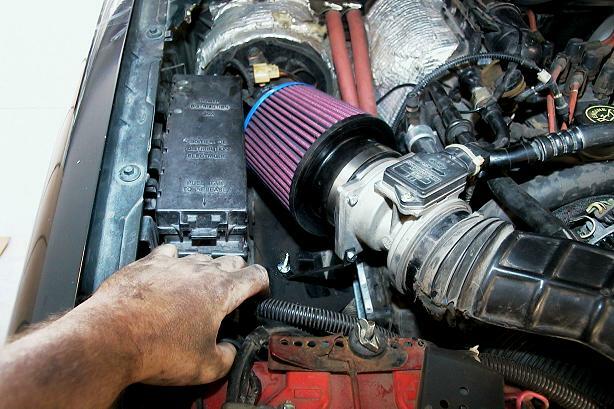 Go out and enjoy your new found power and throaty sound from the high performance intake system.